Warrnambool Fire Brigade averted a great tragedy befalling them when they responded to a structure fire at Warrnambool’s Flagstaff Hill Maritime Village. Flagstaff Hill is a recreation of Warrnambool in the 1800’s set out as a village similar to Ballarat’s Sovereign Hill. 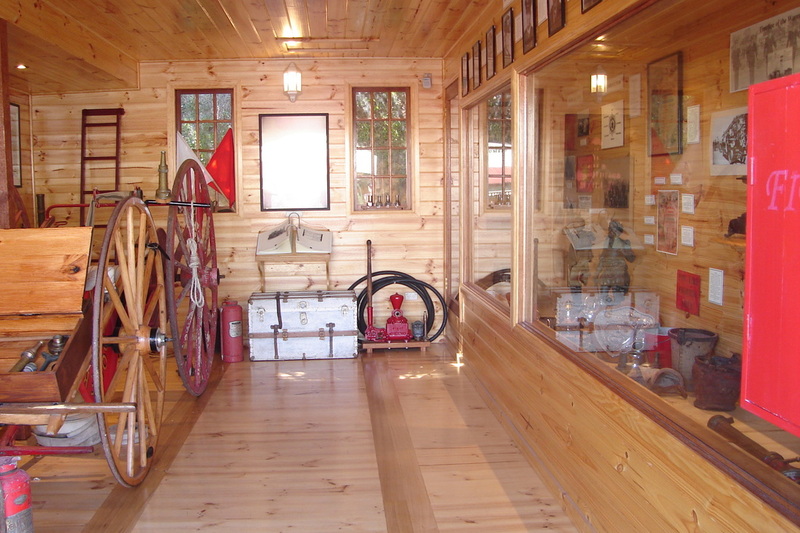 Part of the village is a fire station, which houses many of the Brigades interesting artefacts, trophies and equipment from the 1800’s, including an original hand-drawn ‘cart’, replete with ‘WARRNAMBOOL’ stencilled on the equipment box on the front. 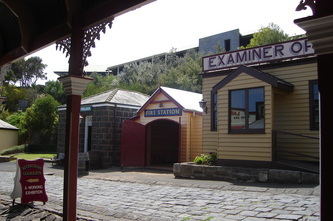 The station was built by Warrnambool Brigade members in 2008, and is modelled on designs of late 1800’s fire stations. It is built to period correct detail, even down to the nails used. Brigade Members had valued support from local businesses and trusts who contributed products and money to the project. A call to a fire in the area was received by the Brigade at 1.14am. As Warrnambool Pumper turned off the highway and headed towards to Village a glow could be seen in the sky, confirming first thoughts of a probable fire. Once on-scene the Pumper crew and volunteers who had responded directly to the scene made access into the village and found that a timber structure which was a newspaper office was fully involved. The immediate exposure to the fully involved building was the fire station. 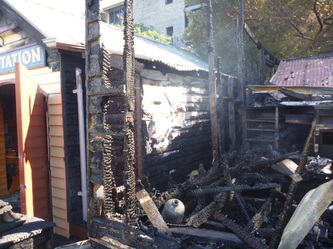 The Pumper moved into the village down a steep cobbled laneway and was positioned approximately 30 metres from the fire. The initial 38mm hose was deployed specifically to protect the exposed fire station, which was smouldering heavily and showing the effects of the immense heat being thrown out from the primary fire; that building was constructed completely of timber, including a shingle roof. Water supplies were an issue, and only enough water could be sourced to run two 38mm lines. As the fire station exposure was contained externally, entry was made to check for fire extension. 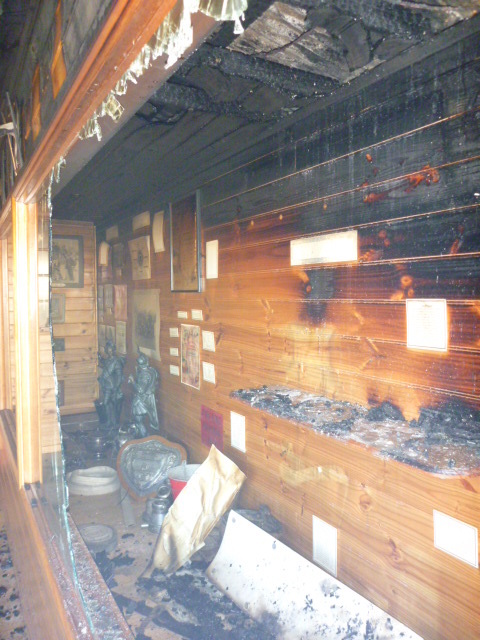 There was extension into the roof and display area, but not significant enough to cause major damage to the contents. Ironically, damaged were photos of SSO David Ferguson, who was the Incident Controller of the incident, and current Brigade OIC Henry Barton. As much of the primary building was consumed initially the fire was under control within a half hour. Overhaul and blacking out was conducted with maintenance of the scene in mind; Fire Investigators attended later that morning and determined that the cause was an electrical fault. The Fire Station was structurally damaged beyond repair and will most likely be re-built under insurance cover. The contents were almost completely saved. In part this is attributed to the good work of the Brigade’s staff and volunteers who attended, but also to the Brigade Members who built the station having to put fire-rated plaster into the walls. This extra protection bought valuable time and was undoubtedly this passive fire protection was the unsung hero of the fire. RDO Steve Giddens, Police and Site Manager attended. More detail, video and pictures: Warrnambool Standard Report.